This classroom or training space is situated at the foot of a busy street in the neighbourhood of Gracia in Barcelona. 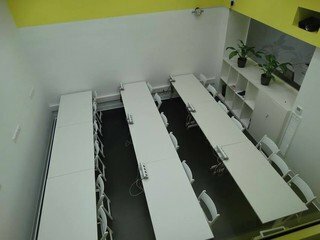 The room holds up to 16 people with 10 fliptop desks and 4 adjustable tables for electronic equipment. It has extensive whiteboard space and plenty of natural light. Rent this space to hold small seminars and inspiring workshops. Clean, modern and fully equipped, the space is ideal for employee training workshops, large meetings and presentations. Enjoy access to the space’s communal kitchen area for coffee breaks and mingle with other entrepreneurs and young businesses who share the building.